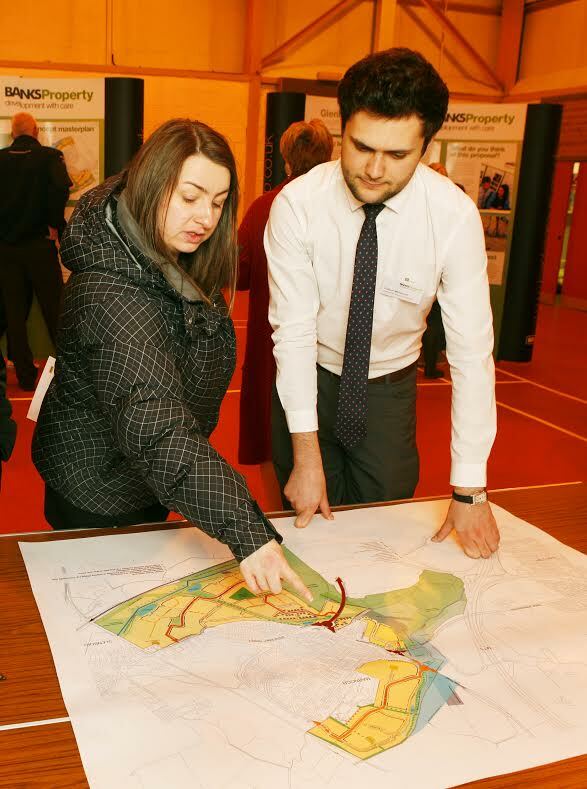 North Lanarkshire residents are being invited along to a further exhibition to find out more about preparation work that would precede the construction of a large housing development. Hamilton based employer, Banks Property, is to host a series of public consultations regarding proposed works that will enable the construction of 1,040 new homes in Glenboig – part of a Community Growth Area identified by local planners and the Scottish Government. Banks Property submitted the overall development proposal to , North Lanarkshire Council, in August 2014 and has since followed this up by submitting the full details of the planned link road, which would provide direct access from the proposed property developments to the Gartcosh Business Park, the local railway station and the M73. The local firm is keen to engage with the community regarding its plans and hopes to gain valuable feedback from those living closest to the proposed site. Information on the proposal will be on display at Glenboig Community Centre between Monday 16 March and Friday 27 March 2015. Colin Anderson, managing director at Banks Property, said: “This is a fantastic opportunity for people living around the proposed development to come and talk to us about how they would like to see work on the new homes progress. “With years of experience of working with the people living closest to our sites, our tried and tested ‘development with care’ approach means that local residents can input into how we carry out the pre-construction work in a manner that is responsible and considered. “We also believe in working with the communities that host our developments to shape our proposals, ensuring they are designed around the feedback we receive and offer the best possible benefits to the local economy. In an area that suffered historically from the loss of its mines, fire clay and steel works, residents can see the potential the development has to revitalise the area and have shown a great deal of support for the project. During the construction of the site, local businesses are encouraged to join Banks Property’s supply chain to maximise local benefits from this significant investment, which will bring a wealth of employment opportunities, with an estimated 700 jobs being created. Information on the proposal will be available at a public event being held at Glenboig Community Centre, Main Street, Glenboig, ML5 2QT. The proposals will be on display between Monday 16 March and Friday 27 March 2015. Those wishing to consult with a representative of Banks Property should attend the display at the following dates and times: Monday 16 March (10am – 12pm); Thursday 19 March (5pm-7pm) Tuesday 24 March (5pm – 7pm); Friday 27 March (2pm – 4pm).